The Monserrat is your wrist’s ‘wow’ piece. 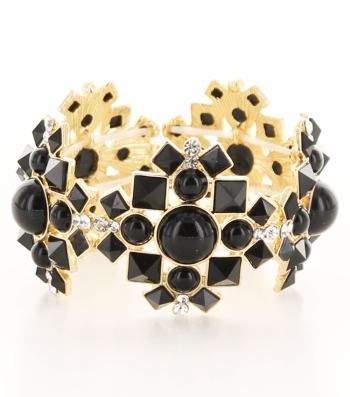 Gold border-set rhinestones in noir black and round-cut clear crystals cluster together to form a gorgeous bracelet on stretch. Clash it with your ripped boyfriend jeans and an oversized-tee. Add this unique jewellery piece to your new outfit and watch those heads turn!